Winter this year had been rather unpredictable with temperatures changing frequently, getting colder or warmer, and at times with a sudden drizzle or even a downpour. The net effect was a bout of cough and cold. So I set out to make the cough remedy at home. Traditional remedy for seasonal cold and cough can be made easily at home. 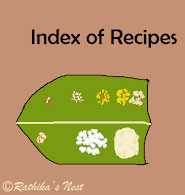 The ingredients can be procured in the shop selling herbal medicine (நாட்டு மருந்துக் கடை). The fresh leaves are readily available in the home garden. Method: Wash basil and Indian borage leaves. Lightly crush tail pepper and dry ginger using the mortar and pestle. Add all the ingredients in a vessel. Boil the ingredients and the leaves with 1½ tumbler (300ml) of water for 5-10 minutes. Switch off the stove. Strain the decoction. You may drink ½ tumbler (100ml) of hot kashayam for relief of cough. This remedy has a strong flavor and taste. If you find the taste not agreeable, take a teaspoon of honey after drinking the kashayam. Medicinal uses of the ingredients: Some of the uses of the ingredients in native medicine are given below. Indian borage is used to treat common cold, sore throat, chronic cough as in asthma and bronchitis, rheumatic pain, digestive problems, hiccups and painful menstruation. Basil leaves are used for treating headaches, indigestion, respiratory and skin problems. Dry ginger helps to relieve nausea, vomiting, indigestion and cough. Licorice is used as a carminative and an expectorant. It also aids in the treatment of viral infections, hyperacidity, constipation and menstrual cramps. Indian long pepper is used to treat cough, fever, indigestion, headache and diarrhoea. Tail pepper is used as a carminative and an expectorant. Note: This is a traditional remedy I have learnt from my family elders and have used it without any problems. However, for specific doses of the ingredients used; or if you have any co-existing medical condition; or if you are already taking other medications, please consult your physician or Ayurveda doctor.